Asia happens to be the continent with the most countries either developing stealth tactical aircraft or trying to acquire stealth aircraft through other parties. The reasons why are simple and at least partially mathematical - Asia has a large number of countries, many of these countries have the technical and population infrastructure to develop highly advanced aerospace industries (or at least the ability to afford to buy what they can’t develop) and many of these countries simply don’t like each other - the perfect ingredients for heated arms races. Below is an attempt at a somewhat comprehensive run-down of Asian nations trying to push their air arms into the 21st century with “4.5” or full fifth-generation fighters, besides the “big four” with regional ambitions or influence and the capability to develop their own aircraft that can rival American, Russian or European efforts, which have already been covered separately - Japan, The People’s Republic of China, India and the Republic of Korea. The vast majority of nations in Asia (and elsewhere) who are attempting to upgrade their air forces to fifth-generation fighters have done so with (at least what was hoped at the time) the easiest and most straightforward path without having to undergo arduous research and development efforts on their own: become partnered nations in the Lockheed Martin F-35 Joint Strike Fighter (JSF) program. Even nations who have their own indigenous stealth fighter development efforts, such as Japan and Korea, have signed on to become partners for a multitude of reasons: it gives them instantaneous access to a (was was hoped) lightweight stealth “low-end” fighter to compliment their own efforts to develop a “high-end” fighter to mirror the relationship with USAF F-35s and F-22s; at the same time it gives them instantaneous access to technology and other developmental sharing efforts that benefit their own stealth research programs; it gives them a stop-gap or fall-back while they wait for their own stealth aircraft to come to fruition or in case they completely fail to do so; and what particularly made becoming an F-35 partner attractive, access to the F-35B Verticial/Short-Take Off (VSTOL) variant which would turn many of these nations’ small helicopter carriers into highly capable fixed-wing aircraft carriers with immense strategic power projection implications. Some of these helicopter carriers/amphibious warfare “flattops” like Japan’s Izumo class and Korea’s Dokdo class have reportedly been designed from the ground-up with the F-35B in mind. Japan&apos;s Latest Destroyer Sure Looks Like An Aircraft Carrier! Below is a list of F-35 partner nations, sourced straight from Lockheed Martin’s official F-35 Lightning II page and the Wikipedia article dedicated to F-35 procurement. The multi-tier “partnership” program, “security partner” program and nations that have selected the F-35 outside of the official Joint Strike Fighter program and instead through traditional Foreign Military Sales (FMS) somewhat makes for a confusing picture; annotations are included. Tier “0” Primary Development Partners: The United States (United States Air Force, United States Navy, United States Marine Corps); Lockheed Martin has originally developed the F-35 at the request of a joint USAF/USN/USMC contract for a fifth-generation replacement for the General Dynamics/Lockheed Martin F-16 Fighting Falcon, F/A-18 “Legacy” Hornet and AV-8B Harrier II, in addition to other tactical combat types. Tier 1 Primary Development Partners: Tier 1 indicates nations that have direct input and influence in the development and design of the Joint Strike Fighter and the Joint Strike Fighter must completely satisfy both the needs of the United States military and the military requirements of Tier 1 partners from the ground up. The United Kingdom (Royal Air Force, Royal Navy) is the only Tier 1 participant of the Joint Strike Fighter program with UK input and design considerations mainly concerning the F-35 VSTOL variant for operation from RN carriers. It is highly unlikely UK design influences would somehow limit other foreign nations in having compatibility issues with their F-35 fleets or limit F-35B operations from their carriers. Tier 2 Secondary Development Partners: Nations that have pledged a certain amount of financial and/or R&D investment in return for guaranteed local F-35 production and/or assembly and/or early delivery. Italy and the Netherlands are the only Tier 2 participants. Tier 3 Tertiary Partners: Nations that have pledged a certain amount of financial and/or R&D investment in return for guaranteed F-35 local production or assembly, delivery at a specifically agreed to schedule or other contractual stipulations made during the early Joint Strike Fighter development process, without having to make the investments necessary to become a Tier 2 partner (at the expense of some design input, accelerated delivery or limitations during local manufacture or assembly). Turkey is the only Asian Tier 3 participant, with Australia being the next closest in geography and relevancy. 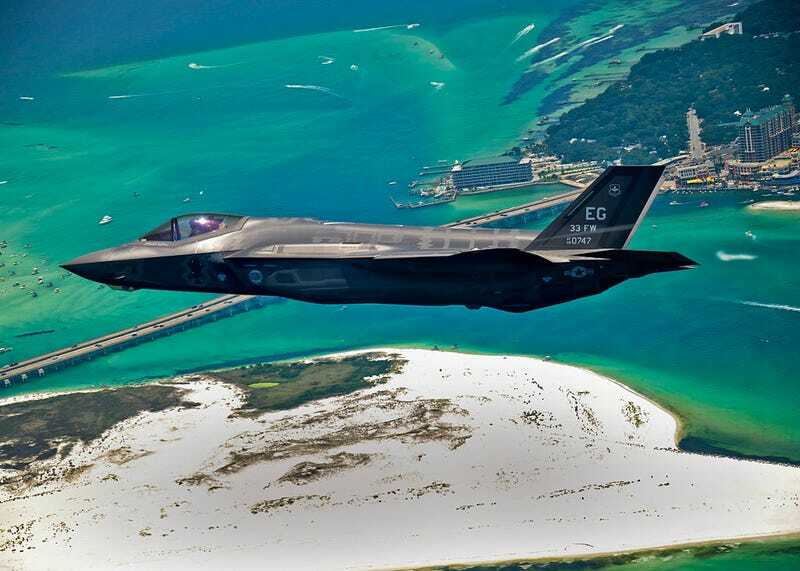 “Security Partners”: Nations that have more or less simply pledged to buy the F-35 once it has entered full production in the hopes of securing better delivery spots and scheduling and have been granted at least limited access to R&D data by the US Department of State. Israel and Singapore are the only Asian nations to have negotiated Security Partner status within the Joint Strike Fighter program (and are the only nations with such status period). Foreign Military Sales-Approved: These nations have elected to purchase the F-35 separately from direct Joint Strike Fighter program participation through the more traditional Department of State-handled “FMS” channels. These nations are “last on the list” and simply have to wait for their turn on the production line, and may have no design input with having to accept the final product “as-is.” They may also have extremely limited access to F-35 technology or classified technical specifications, or may have to wait for such access. These nations may not have been able to afford greater participation pledges or may have selected the F-35 late in the process when preferred partnership access had been closed. Japan and South Korea have elected to obtain F-35s through FMS channels, though they have also been able to use their economic and political influence to obtain guaranteed local production and/or assembly of F-35s as well (but as they are not active Joint Strike Fighter program participants, such local production/assembly will be delayed). Other Asian nations may elect to purchase the F-35 upon entering full production, dependent on economic and political factors. The Israeli Air Force has always been highly invested in becoming one of the most technologically advanced and capable air forces in the world, which has been extensively documented elsewhere. They had also been highly invested in the development of stealth and other anti-detection technologies since the various 60s and 70s Arab-Israeli Wars when enemy anti-aircraft missile sites started swatting IAF aircraft from the sky. The success of these Arab missile batteries had been surprisingly short-lived as the Israelis quickly figured out how to develop countermeasures of electronic and other means, including the development of highly sophisticated “spoofers” and anti-radiation missiles to directly destroy these missile batteries before they had a chance to engage. Israel is considered to have among the most sophisticated electronic counter-measure gear on the planet, and many customers of advanced American or Russian aircraft have elected to stuff their frames with Israeli made equipment instead, including India and Malaysia. Currently Israel is a “Security Partner” in the Joint Strike Fighter program, but it’s a relatively safe bet they may have a highly classified stealth aircraft program of their own. The Israelis have a long history of indigenous aircraft development, including the “Kfir,” an unlicensed copy of the French Mirage fighter (the reasons why being worthy of its own story) and the “Lavi,” a highly evolved version of the F-16 optimized for deep-level strike that was canceled after political pressure was applied to make Israel buy American-assembled F-16 variants instead. Given the Israeli “necessary high quality to defeat overwhelming quantity” approach, it’s almost unreasonable to assume that Israel isn’t at least making some indigenous stealth fighter effort. If nothing else, the Israelis are highly likely to develop their own F-35s into highly evolved frames just as they have with their F-15s and F-16s. In addition to being a Tier 3 Joint Strike Fighter partner, Turkey is working on their own “TFX” (Turkish Fighter eXperimental) stealth fighter program. The TFX will likely be intended as a higher-performance compliment to the F-35, so a twin-engine configuration is likely. Reportedly, Turkey has in turn partnered with either Korean Aerospace Industries, SAAB, or both to help develop TFX and share technology and designs with the firms who are in turn working on their own stealth efforts. Turkey has a long tradition of producing their own variants of various fighters including the F-16, and local production is a high priority for Turkish military procurement. A Republic of Singapore Air Force F-15SG Eagle, a variant of the F-15 even more highly evolved than those that serve the USAF or almost any other country. Official USAF photo via Wikipedia. Singapore is a “Security Partner” of the Joint Strike Fighter program, but also has a history of being able to squeeze out a lot of capability from their airframes. They have been, for example, able to develop or co-develop electronic countermeasures for their F-15s and even their antiquated A-4 Skyhawks to give them an increased degree of electronics-based “pseudo-stealth.” It’s highly likely their F-35s will have increased electronic capability as well. Saudi Arabia is looking to purchase fifth-generation fighters sometime in the future and is evaluating possible current and future options. Currently the RSAF operates highly advanced versions of the F-15E known as the F-15SA (for Saudi Arabia) that are roughly analogous to other operators’ variants such as the F-15K and F-15SG as well as older F-15Cs. The RSAF also operates the Eurofighter Typhoon which has some low-observable characteristics. Malaysia currently operates the Su-30MKM variant of the Sukhoi Su-27 Flanker, a highly evolved “4.5 gen” variant with some low-observable characteristics incorporated into the design and sophisticated electronic counter-measures of Israeli and Indian origin. They are also actively shopping around for one selection from the Eurofighter Typhoon, Dassault Rafale and Boeing F/A-18E/F Super Hornet, all of which are also 4.5 gen fighters incorporating low-observable characteristics or capable of being upgraded or remanufactured with such features. Like Malaysia, the Vietnam People’s Air Force has advanced Su-30 Flanker 4.5 gen multi-role fighters. Iranian “stealth” efforts are infamous enough in their own right. Most likely and most practically they will adopt similar low-tech sneak attacks employing non-technology based stealth tactics similar to North Korea. Pakistan is a likely customer of Chinese stealth fighter exports such as the J-31/F-60 covered previously and J-10 4.5 generation fighters. They have already co-developed the JF-17 “Thunder” with China. The Republic of China is in a quandary compared to other Asian nations. They have the wealth and intellectual base to develop stealth fighters or outright purchase them but are stymied by political pressure from the United States, who in turn is politically pressured by one of the U.S.’s largest trading partners, the People’s Republic of China. They have made official requests for F-35s but pressure from the Mainland applied to American lawmakers makes that an iffy proposition. They may try to develop their own stealth fighter but such efforts will be difficult without outside assistance, which again may be denied through political pressure. So far their greatest effort towards a stealth fighter is in the F-CK-1 indigenous defense fighter, which not only was developed with a high degree of technical assistance from the U.S. (it is technically an extremely evolved and localized variant of the F-16) but came up with deficient performance due to the type of technology transfers they were approved for, particularly in regards to engine and radar technology. The fighter has since undergone an upgrade program to -C/D standards but it is still far from being even a truly competitive 4.5 gen fighter capable of tackling the Mainland’s massive air fleets of highly advanced Flankers, J-10s and future stealth developments. An Italian Air Force A-11 “Ghibli” strike fighter. This type was in fact co-developed by Brazil’s Embraer aerospace firm and represents one of the most advanced indigenous fighter efforts from South America as of yet. Official USAF photo via Wikipedia. Outside of Asia, the United States and Europe few nations have the capability to develop or even buy stealth aircraft. This is a quick run-down of what’s left. Both SAAB and Brazilian aerospace firm Embraer have displayed interest in developing stealth aircraft, not only for their native Swedish and Brazilian Air Forces but also for the export market. SAAB has in fact partnered with Korean Aerospace Industries for the Korean F-X effort; it’s likely Embraer is developing some sort of stealth concept at least on paper. South Africa’s Atlas aerospace firm had been developing a 4th generation fighter called the Carver that later in the development stage may have been evolved into a 4.5 gen fighter incorporating low observable characteristics. Due to a lack of available foreign partnership participation during the time of Apartheid, moving the program proved difficult. With the fall of Apartheid it was decided to simply purchase now readily available foreign aircraft, principally the SAAB J39 Gripen fighter.